林江涛, 张永明, 王长征等. 大环内酯类药物的抗菌外作用与临床应用专家共识. 中华内科杂志. 2017. 56(7): 546-557 . Wang C, Xu J, Yang L, et al. Prevalence and risk factors of chronic obstructive pulmonary disease in China (the China Pulmonary Health [CPH] study): a national cross-sectional study[J]. 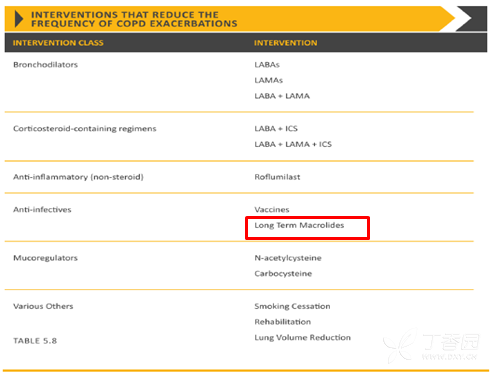 Lancet, 2018, 391(10131) . 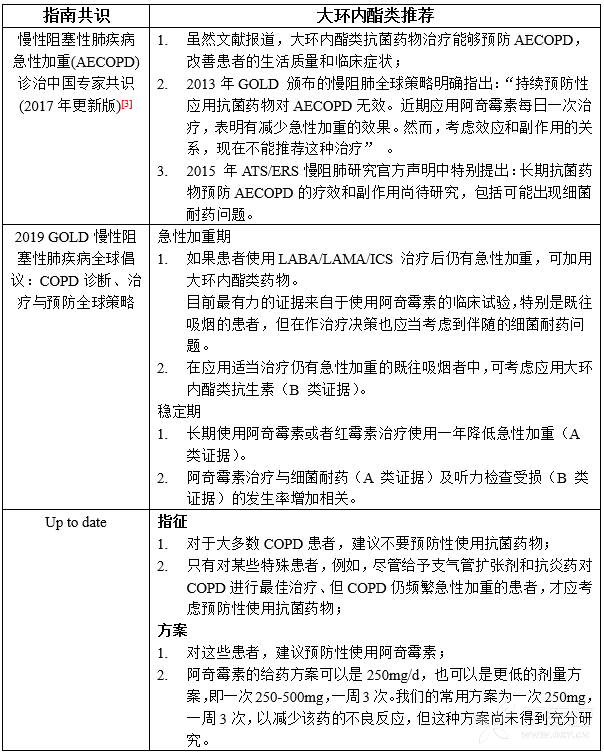 慢性阻塞性肺疾病急性加重 (AECOPD) 诊治专家组. 慢性阻塞性肺疾病急性加重 (AECOPD) 诊治中国专家共识 (2017 年更新版). 国际呼吸杂志. 2017. 37(14): 1041-1057 . 中华医学会呼吸病学分会哮喘学组. 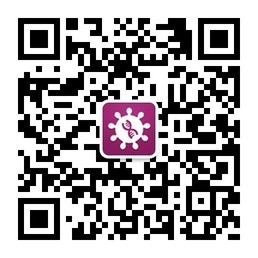 上-下气道慢性炎症性疾病联合诊疗与管理专家共识. 中华医学杂志. 2017. 97(26): 2001-2022 . Polverino E, Goeminne PC, McDonnell MJ, et al. European Respiratory Society guidelines for the management of adult bronchiectasis. Eur Respir J. 2017. 50(3) . Mã M G, Mã i L, Olveira C, et al. Spanish Guidelines on Treatment of Bronchiectasis in Adults[J]. Archivos De Bronconeumología, 2017, 54(2) . 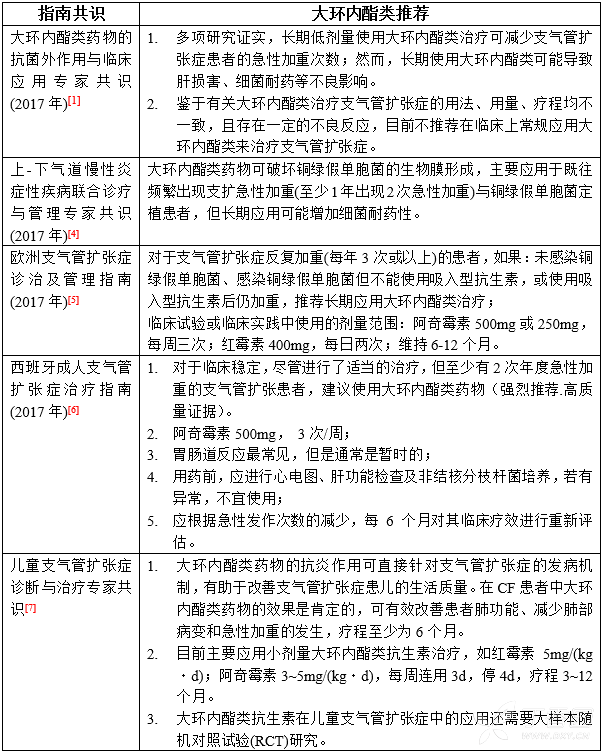 中华医学会儿科学分会呼吸学组疑难少见病协作组, 国家呼吸系统疾病临床医学研究中心,《中华实用儿科临床杂志》编辑委员会. 儿童支气管扩张症诊断与治疗专家共识. 中华实用儿科临床杂志. 2018. 33(1): 21-27 .